Cade was the first to wake up, so he came in our room and patiently waited for Connor to join us. Finally he woke up and Cade went to get him, then checked out the window to see if Santa was still outside. Just what he asked Santa for! A red bike! The reindeer nibbled at Cade's carrots and left him a little treat ;) We pointed it out to Cade and asked him what it was. He said, "poo poo" looked closer and said, "No, raisins!" Then he walked off like nothing was unusual about it. My gift from the boys. They wanted to pick out something from the dollar section at Target for me, this is what they chose. Cade saw it in a little bag under the tree, grabbed it and brought it to me. The boys love their gift from Grandma and Papa Long. Every year we give ornaments, this is the ornament Connor chose from Cars 2. Cade has been asking for a piggy bank for months now. Finally Santa brought him one and Connor got a Rhino Bank. He also put 2 quarters in each bag so they could put money in them right away. Gammy and Gampa Sommers gave the boys this Leap Frog game. Look at Connor's face! Another gift from them...Connor was very excited! This was the gift from above, Hot Wheels bathtub toy. They can't get enough of it! And finally they gave them some building blocks. These are their first blocks, another big hit. Santa also brought the boys some more toys for their work bench Papa and Grandma gave them last year for Christmas. from the back. He's a true construction worker ;) I promise we did not do this to him! Complete w/ Egg Strata, Frozen Fruit Slush and Orange Juice. All the mess, but that would have to wait. We now have to go to church. 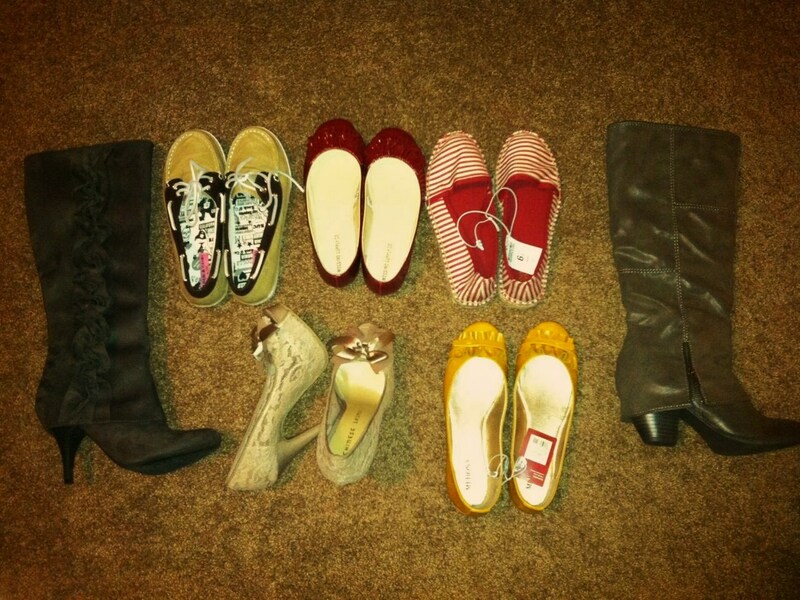 But first, all the shoes I got!! My parents gave me the boots on the left and my in-laws got me the boots on the right along w/ the boat shoes on the top left. Cameron got me all the rest...he actually apologized that he only got me shoes. haha I told him that is not something to feel bad about at all! All the shoes were found on my pinterest (except for the boat shoes, Cam picked those out all by himself). Connor's new church outfit. I bought their ties from a lady who makes them and then went to Kid to Kid and found matching shirts and vests! They worked out perfect! After church and kid's naps we went to Dave and Lisa's house (cam's brother) for dinner. The kids had so much fun together. They gave the boys this fun Toy Story fishing game. They made forts, one for the boys and one for the girls. They could've played w/ these light sabers all night! (well they practically did) Mason said he loved this picture b/c he thought he looked cool, I have to agree. Then we finished off the night w/ ice cream and homemade apple pie. Yum! Thanks Dave and Lisa for having us over! We had a great time. The next morning the boys had a great time playing w/ all their new toys. These were the pjs I originally got them for Christmas Eve, but later I found the Buzz and Woody ones and couldn't pass them up. Hope everyone had a wonderful Christmas, I know we did! Coming Down the stairs to see if Santa came. Going outside to see if Santa's Reindeer ate Cade's Carrots. We went to Joe's Crab Shack for Dinner Christmas Eve. The boys loved the indoor play center. Cam and I loved our Steam Pots. Ummm....??? He was posing for this picture, weird right? Once we got home, we all got to open one gift. The boys were really excited...although Cade kept saying he was tired and wanted to go to sleep (he knows Santa only comes when he's asleep). That was until he got the gift. He decided he had to run upstairs to get his Woody Hat. He even slept w/ it (and you'll see later that he even brought it down Christmas Morning). As as Buzz had his PJs on, he yelled, "Fly!" And ran around the room. Don't they make the cutest Buzz and Woody?! We started reading The Night Before Christmas last year on Christmas Eve. This year we continued this tradition before putting the boys to bed. The boys decided they had to put treats out for Santa. And Cade even thought of the Reindeer. He decided it would be best to put carrots outside. Throwing them off the porch. Cade then decided he needed to get another carrot, broke it and said the little carrot was for the little reindeer and the big was was for big reindeer. Very thoughtful right? Look at that look, so serious! After Santa's visit. All ready for Christmas morning.